Isn't summer wonderful? Suddenly there's time to do all the things that get pushed to the side during the school year and in my case, that's blogging. So if you've been paying attention, I have successfully posted EVERYDAY this week!! Not gonna lie...I'm kinda proud of myself! :) Haha...let's see how long this lasts! 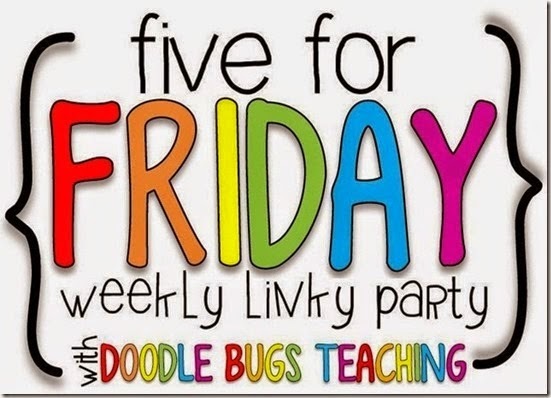 Today is Friday and that means I'm linking up with my sweet friend, Kacey over at Doodle Bugs Teaching for Five for Friday. Who else is obsessed with this show??? The second season came out last Friday on Netflix and I have been binge watching ever since. It's SOOO good! Since discovering home blogs recently, I'm all into DIY projects and painting! I've been painting several little tables and I'm about to start on a swing that one of my sweet former first grader's dad made for me. Want to share your 5 randoms? Link up at Doodle Bugs! Oh my goodness! I love love love that water cup!! Also, you have convinced me. I need to start watching Orange is the New Black. I have heard such great things about it! I'll add that to the summer bucket list! love that stack of sentence strips/cards. I have heard so much about orange is the new black.. I might check it out! Love Orange is the New Black! This season seems way more intense than last season! Love the water cup too! I am definitely obsessed with Orange is the New Black! I can also relate to you. I was a 2nd grade teacher now a 5th grade ELA teacher as well! Hope you have a great summer! Love Orange is the New Black!! I have been watching it too!!! !